I am a conservation scientist. Like any other scientist, I develop and test hypotheses, trying to figure out how the world works. Once I learn something, I publish my results in academic journals where other scientists can evaluate and build upon what I’ve learned. Because I’m a conservation scientist, however, I also need make sure the people who directly impact prairie conservation (ranchers, land managers, policy makers, etc.) get my information and use it to improve the way grasslands are managed and restored. If I fail to influence the actions of others in positive ways, I fail as a conservation scientist. It doesn’t matter how much we learn about employing prescribed fire effectively if we’re not able to help others use the lessons we learn. In science, keen observational skills and creativity often spark innovations, but rigorous collection of data is required to see whether a great idea actually makes sense or not. While I’ve had some good ideas, I’ve also come up with plenty of grassland management and restoration strategies that turned out to be duds. In each case, I learned a little more about prairie ecology and our land stewardship improved as a result. 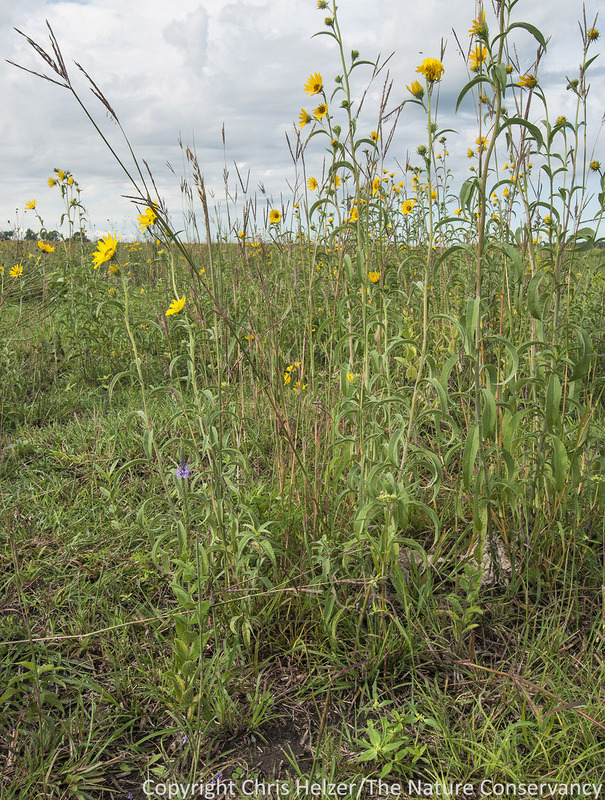 I’m proud of the work I’ve done over the years to develop new and better ways of restoring and managing prairies. I know those strategies are effective because I’ve spent a tremendous amount of time testing them, through both observation and rigorous data collection. My computer is full of spreadsheets and graphs showing how prairie species and communities respond to various treatments. I’m also proud of the work I’ve done to share what we’ve learned with others, but until recently, I’ve done very little to evaluate the effectiveness of that work. I’m not alone – most of my colleagues in the world of conservation science do a great job of measuring the natural world and its responses to human activities, but do very little to evaluate whether their work is actually influencing conservation. It’s fairly ridiculous when you think about it. We would never think of devoting ourselves to a new invasive species control technique without testing its effectiveness, but for some reason we’re satisfied to rely on blind optimism that our outreach strategies are changing the world. Come on, folks! We’re scientists! We love data, and we’re good at developing and testing ideas. Why do we apply that passion and aptitude to only part of our work? Why aren’t we testing whether our ideas are reaching the intended audience and influencing on-the-ground conservation work? How can we adjust and improve our outreach strategies if we don’t have any data to work from? To be fair, measuring outreach impacts requires a very different kind of scientific approach than most of us are comfortable with. Instead of counting plants or observing behavior of birds, bees or bison, we have to assess the attitudes, motivations, and actions of people. Many of us took our career paths because we prefer the company of birds, bees and bison to people, but that doesn’t give us leave to just ignore people altogether – especially when the success or failure of our work hinges upon their actions. Fortunately, we don’t have to work alone. There are lots of scientists who are already good at studying people, and many of them are happy to work with us. I’ve had very enthusiastic responses from those I’ve asked advice from, and their input has been very helpful. We should probably take some of the energy we spend studying animals and put it towards studying the way people respond to our outreach efforts. Whether you’re a scientist who actively shares your results with your target audience, or someone who relies on others to translate and transmit that information, there are some basic questions we should all be trying to address. This is far from a comprehensive list, but it’s a start. What lessons and messages from my work are most important? Who is the audience for those? What messengers/media will best reach the audiences? What are the current attitudes/actions of my audience? What are the main drivers of those those attitudes and actions? Who are the credible voices my audience looks to for guidance? How can I reach those credible voices? Are my messages reaching my target audience? How many people in that audience am I reaching? Are my messages changing attitudes and/or actions? At what scale, and to what degree am I making a difference? Which messages, messengers, and media are most effective for reaching each of my audiences? Many of us host field days, at which we can share what we’re learning with others. How many of us are assessing the effectiveness of those field days and other outreach strategies? I’ve spent a lot of time thinking about audiences and messages, and it’s really helped me focus both my research and outreach more effectively. Recently, I’ve also started trying to answer some of the questions in the above “Evaluating Success” category. I’m making some progress, but I need to do much more. I can tell you how many presentations I’ve given over the last two years (40) and how many people were in those audiences (3,447). I’ve also been keeping track of calls and emails asking for advice on prairie restoration and management. Unfortunately, while I have a lot of numbers, I can’t easily translate them into acres of improved management or enhanced habitat quality. I have, however, made at least some progress toward measuring conservation impact on the ground. Much of that success came from survey work by one of our first Hubbard Fellows, Eliza Perry. Eliza conducted interviews with some land managers and private lands biologists who had attended field days at our Platte River Prairies. Among her many findings were that almost all respondents said what they learned from us had influenced their work, and they conservatively estimated that over 330,000 acres of land had been restored or managed differently because of that influence. Beyond that, Eliza was able to identify key factors that led to our success and suggest ways to improve our effectiveness. In addition, Eliza surveyed readers of The Prairie Ecologist Blog and I conducted a follow-up survey three years later. Those surveys helped quantify the demographics of readers (e.g., about 2/3 of respondents have direct influence on prairie management). 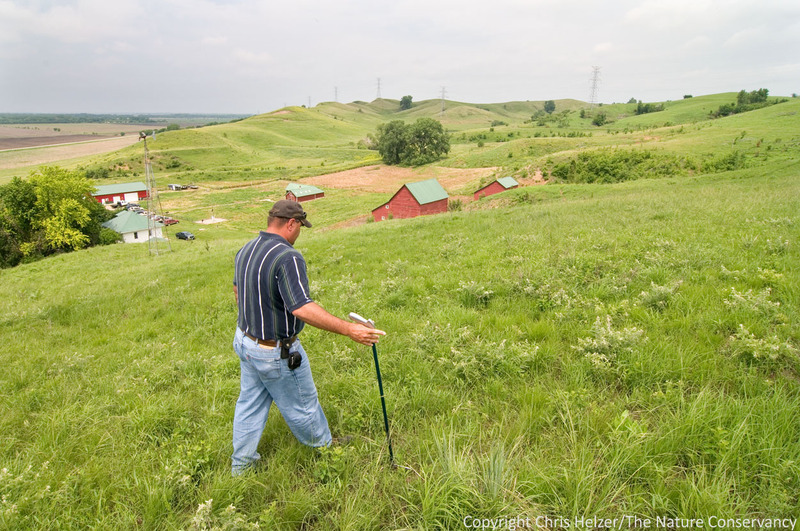 The surveys also measured the degree of influence the blog has on readers’ understanding of prairies and approach to managing or restoring prairies (when applicable). We even got a rough estimate of the number of acres on which management had been influenced by the blog (over 300,000). Being able to quantify outreach impact, even when the numbers are fuzzy and incomplete, has been really helpful. It helps me justify my job, for one thing, and assures both me and my supervisor that the time I spend writing, giving presentations, and consulting with others has value. Most importantly, it helps me assess what is and isn’t working and adjust accordingly. While it’s still not fully within my comfort zone, I’m trying hard to make sure I’m measuring the effectiveness of our outreach efforts, just as I do our prairie management and restoration work. I would love to hear from people who are trying to do the same thing, especially if you’ve found effective evaluation strategies. As more of us focus on measuring the success of our outreach work, we’ll be able to learn from each other and establish some common metrics. Hopefully, we’ll also become more effective at translating what we’re learning into large scale and meaningful conservation impact! Back in August, I posted some questions to readers about what they look for when evaluating their own prairies. I got some excellent responses, which I really appreciated. If you missed them, you can re-read that post and those comments here. Walking around a prairie and getting a read on what’s happening is probably the most important part of prairie management. 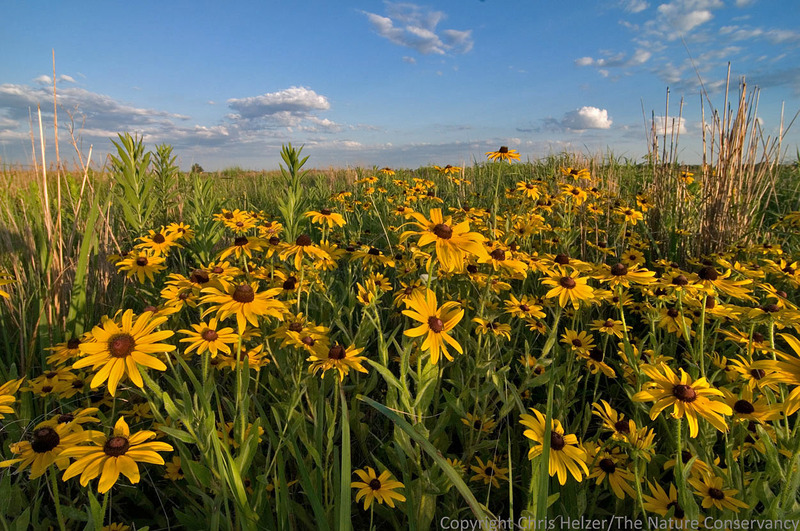 Scott Moats, The Nature Conservancy’s Broken Kettle Grasslands, Iowa. As a follow up to that, here is more detail about what I think about as I walk around my family prairie, or one of our Platte River Prairies. Of course, sometimes I just hike around and enjoy the day, but this post is about what I focus on when I’m evaluating our management and considering ideas for next steps. We collect some relatively formal data on some sites, but most of our management decisions are really based on the kind of observation and evaluation I lay out here. I’m certainly not trying to talk you into doing exactly what I’m doing – especially because what I look for is tied to my particular objectives, not yours. Instead, I’m hoping that I might spark some ideas you can incorporate into your own decision making processes. 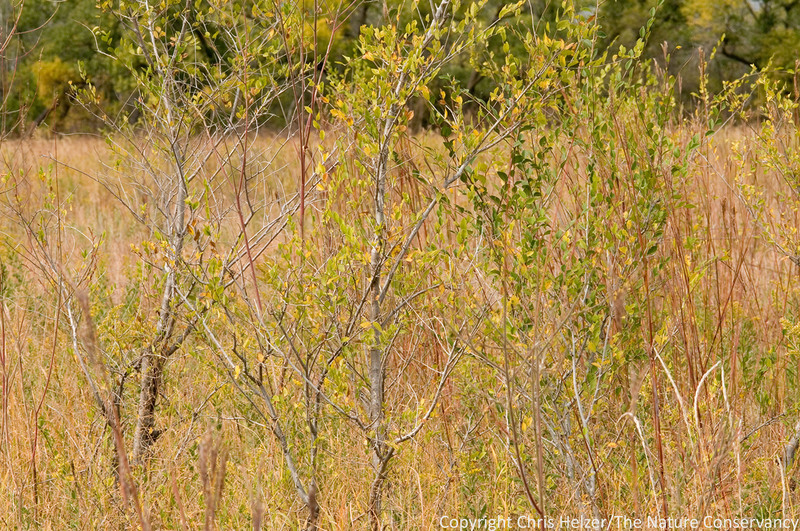 Grazing can create very important habitat structure, including this short grass/tall forb habitat at our Platte River Prairies. This habitat allows for easy movement along the ground, but provides plenty of overhead cover as protection from predators and the hot sun. Not surprisingly, the first thing I look for, then, as I walk around a prairie is the pattern of habitat structure. I hope to find the full range of variation, from tall and dense vegetation to almost bare ground. Even more importantly, I want to see some of the important intermediate habitat types – especially short-cropped grass with tall forbs (wildflowers), which is incredibly important for many wildlife and insect species. If I can find all of those habitat types, and they’re in different places than they were last year, I feel pretty good. Next, I look at the plant community. Plant diversity is an important foundation for invertebrate and wildlife diversity, so I want to see a rich diversity of plants as I walk around. I also want to see that diversity at both large and small scales. Across the whole prairie, I’d hope to find at least 100-200 plant species (though I certainly don’t count them every time) but I should also be able to count at least 10-15 plant species within arms’ reach if I kneel on the ground. These numbers vary, of course, based on geography, soil type, etc., so they may or may not be reasonable at your particular site. As I look at plant diversity, I want to see habitat patches with an abundance of “opportunistic” plants. These are species that thrive in the absence of competition. Depending upon your point of view, you might also call them “colonizers” or even “weeds”, but when they are abundant, it means that nearby dominant plants have been weakened. We try to periodically knock back the vigor of dominant plants (especially grasses) through fire, grazing or mowing, to help less dominant plants maintain a foothold in the plant community. A flush of opportunistic plants is an indicator of success because it shows that we successfully opened up that space and other plants are taking advantage of it – and not just the weedy ones. Finding seed heads, and even new seedlings, of slower-to-colonize plant species (purple prairie clover, entire-leaf rosinweed, leadplant, etc.) within those weedy patches makes me feel even better. Black-eyed susan is a showy example of an opportunistic plant species that thrives when surrounding vegetation is weakened. Other opportunists I look for include ragweeds, hoary vervain, annual sunflowers, ironweed, ragwort, annual thistles, and many others. In sites where cattle are present, I spend time looking at what they’re eating and not eating, as well as which parts of the prairie are being grazed most and least. In our patch-burn grazed prairies, we expect most grazing to take place in recently-burned areas, so I check to see if that’s happening. Often, cattle target their favorite grass species first and then graze wildflowers only if they’ve already eaten the best parts of those grasses. If I see something other than that pattern, it can tell me a lot about our stocking rate or other issues – not necessarily in a bad way. There are also a few plant species that our cattle can’t seem to resist (some milkweeds, rosinweed, Canada milkvetch, and spiderworts) and we like to make sure those species get a release from grazing pressure every few years. As a result, I pay special attention to whether or not – and how intensively – those plants are being grazed. If I notice that they haven’t been allowed to grow and bloom for a few years, it’s time to change up our management and give them a rest. The other group of plant species I look closely at is invasive species. At our sites, invasive grasses such as smooth brome, Kentucky bluegrass, tall fescue, and others get special attention because of their ability to form monocultures, but there are plenty of others to watch as well. I look not only at the current abundance and density of invasive plants, but also compare what I’m seeing to previous years to see how things are changing. Finally, I pay attention to whether or not there are conditions that appear to be giving invaders an advantage. For example, it would be important to know if cattle are grazing all the plants EXCEPT those invaders, allowing them to encroach upon weakened competition. Siberian elm trees are a major pest in our prairies, and we have to be careful not to fall too far behind in our control efforts. Field notes and photos are really helpful when trying to decide whether populations of invasive species are expanding or not. They can also be helpful when comparing grazing impacts, responses from opportunistic plants, and other interesting phenomena. I sometimes flip back to last year’s notes while I’m in the field to see if there’s anything I saw then that I should pay attention to. Then, when I periodically enter my field notes into the computer, I can look at all the notes from other years and look for patterns. I don’t take extensive field notes, but try to write enough to be useful. (See here for more on field notes). As I continue to learn more about the way various animal and invertebrate species see and utilize prairie habitat, I’ve gotten better at looking our prairies through the eyes of those species. I wrote about wearing “bee goggles” a while ago, but I also try to step back and think about what life would be like in our prairies if I was a grasshopper, mouse, coyote, or other species. Could I find food all year round? Are there places to feed/hunt or hide/escape? If the habitat I’m living in changed dramatically because of fire or grazing, would I be able to find and travel to other habitat nearby? It’s a really interesting exercise, and helps me think about habitat needs in new ways. 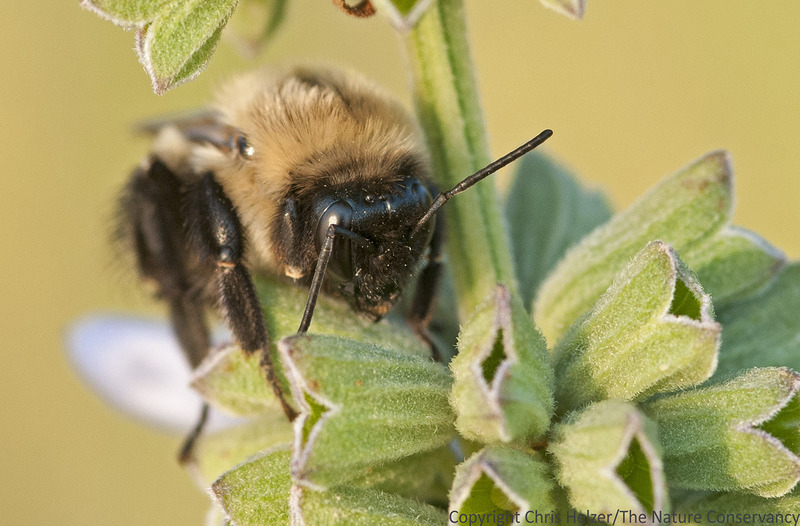 Looking at a prairie through the eyes of bees or other species is a great way to broaden your perspective. Finally, I try to look across the fences and note what is happening on neighboring lands. In some cases, the prairie I’m walking in is the only real prairie habitat in the neighborhood, so it really needs to provide everything for every species living in it. In other cases, there is more grassland habitat nearby, and I can think about how our prairie can help supplement and complement what’s available in those other sites. For example, if all the neighbors graze pretty intensively, I might prioritize tall vegetation structure a little more than if that was the predominant habitat in the neighborhood. So there you go – a quick look inside my head, for what that’s worth. As I said at the beginning, what you look for should be tied to your objectives, but I also enjoy tagging along when other prairie managers walk their sites because I learn a lot from how they think. I’d love to hear how similar or different my thought processes are from yours.